The holiday season is upon us and, often this means guests are coming and going (or coming and staying) and potential hazards can become more available to the family dog. Some Christmas plants can be hazardous. According to the Pet Poison Helpline, ingestion of Christmas tree needles can irritate the mouth and stomach, resulting in vomiting, diarrhea, and drooling. Poinsettias contain a milky white sap that can cause mild vomiting, drooling, and diarrhea when ingested by pets. If mistletoe is ingested mild vomiting, nausea, and diarrhea can occur but, if very large amounts are ingested, there is the potential of cardiovascular and possibly neurologic issues. If pets ingest Amaryllis flowers and leaves, vomiting, drooling, and diarrhea most commonly occur. Ingestion of the bulb, which is more toxic than the flowers and leaves, can possibly result in weakness, tremors, seizures, and changes in blood pressure. Holly, when eaten, can also cause vomiting, diarrhea, drooling, and lethargy (Flint, 2014). 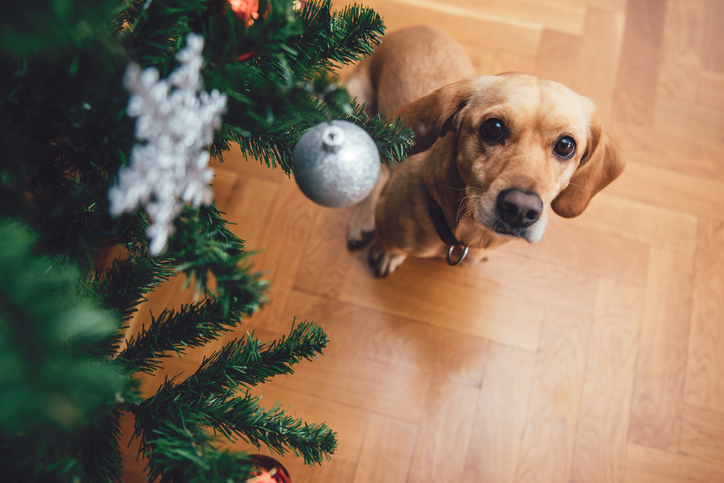 Tree ornaments like tinsel, ribbons, bows, and ornaments can be hazardous to pets. Homemade salt dough ornaments are a popular craft around Christmas but this dough is hazardous to dogs so make sure these types of ornaments are well out of reach of dogs. Dogs are sometimes attracted to the ingredients so, use caution when making the ornaments. This type of dough contains large amounts of salt which, when ingested, can cause neurological issues and seizures, so any dog suspected of ingesting salt dough should see a vet immediately. Chocolates, raisins, xylitol, and grapes are poisonous to dogs so keep them out of reach of the dog. When dogs eat something containing xylitol, the xylitol is quickly absorbed into the bloodstream, resulting in a potent release of insulin from the pancreas. This rapid release of insulin causes a rapid and profound decrease in the level of blood sugar (hypoglycemia). Untreated, this hypoglycemia can be life-threatening. Symptoms of Xylitol poisoning are vomiting, weakness lack of coordination or difficulty walking or standing, depression or lethargy, tremors, seizures, coma (Brutlag DVM, n.d.). Cooked turkey bones can splinter and cause health issues if ingested by the dog and unattended platters of food may cause indigestion and diarrhea. Holiday guests may not be used to dogs and may have medications, nicotine and or marijuana with them which can be hazardous to dogs. Ensure that guests know to watch for pets who may try to get outside if feeling overwhelmed or may get underfoot. Be sure that your pets are microchipped and wearing identification (and for very skittish or newly adopted dogs use GPS on the pet) just in case they get loose. The tree lights and electrical cord pose a hazard if chewed so keep them out of the way of curious dogs who may chew. Presents under the tree may contain items hazardous to dogs so, if the dog is not trained to leave items alone, keep gifts out of reach of the dog. Giving the dog some quiet time in a separate room if he needs it. Food dispensing toys (available at all our local pet supply stores) help keep a dog occupied. For a dog who is having trouble coping despite the management of the situation, there are also products that can help and that your veterinarian can recommend. Have a safe and happy holiday season! These organizations require a minimum number of continuing education units be obtained to retain certification. She is also a professional member of The Pet Professional Guild, an organization committed to force free training of animals and the Association of Professional Dog Trainers, a professional organization of individual trainers who are committed to being better trainers through education. Jane is the content creator of the online course Assessing and Interpreting Dog Behaviour, which is a course for law enforcement personnel who meet unfamiliar dogs in the course of their duties. She is the author of Perfect Puppy Parenting, a guide to raising a happy, confident, well-behaved dog. Jane spent 17 years working for Customs Border Services and in joint teams with US Homeland Security and the RCMP. She spent a further 8 years working as an Animal Control Officer and Bylaw Enforcement Officer. Jane lives on a small farm with dogs, sheep, donkeys, and chickens. The dogs each came from situations that prevented them from living in their original homes. The dogs range in size and age and with the dog training and behavioral work, whether it's participating in the development of an online training course, working with a client's dog or tracking a lost pet or animal.